I recently finished The Penderwicks In Spring by Jeanne Birdsall and oh my goodness was it ever delightful! One of the many bits of lore you learn about this family is that at the age of five (the age of reason according to the mother) each of the Penderwick sisters picks their favorite birthday cake which is made from scratch every year from then on. If you haven’t read this book, go to your library asap. I’m now going to back to read all The Austin Family stories by Madeleine L’Engle; the Penderwicks and the Austins have a lot in common as far as literary feel goes. To celebrate Kitty’s first birthday I made Caramel Apple Buckle and I plan on making it for her every year till she is at the age of reason (at which point I hope she chooses this cake all on her own!) It was originally inspired by this recipe, but I changed so much about it that I feel confident now calling it something entirely new. There are no pictures of the first cake, it was that good. I made it a week later when we hosted a smorgasbord board game night with a few friends. This time around I took detailed mental notes and snapped a few quick pictures before it vanished. 1. In a small bowl grate fresh nutmeg for as long as it takes to sing the first verse of this Mother Goose rhyme “I had a little nut tree, nothing would it bear, but a silver nutmeg and a golden pear.” (if you’ve never heard this nursery rhyme put to song, it is a sweet little tune). Thoroughly mix with the brown sugar. If you don’t have whole nutmeg, add 2 tsp or more of ground nutmeg skipping the singing part. This may seem like a lot of nutmeg, and it is; the nutmeg makes this cake! It tastes like this cake has been soaked in some pungent liquor thanks to my favorite spice. 2. In a separate bowl cream together white sugar, butter and coconut oil. Slowly add eggs one at a time till thoroughly combined. Mix in almond extract. 3. Sift flower and baking powder onto the creamed mixture. Before mixing the flour into the batter, pour the milk in and then beat on medium until well combined. Don’t over mix, the batter will be very thick. 4. Spread 2/3 batter into greased 9×13 pan or round springform pan. Sprinkle nutmeg mixture evenly over batter then layer in half of the diced cinnamon apples. Gently spread remaining batter over apples, it will be a very thin layer of batter and it doesn’t have to be perfectly even. Spread the remaining apples over the top. 6. I’d never poured sweetened condensed milk on a cake before, but I was pretty sure such things were done, so after the cake cooled, I cut the cake into pieces while still in the pan and poured the entire can fairly evenly over it. It looked goopy, gross, and too thick and I had a few moments of utter despair which was only heightened when I discovered we were out of the trusty backup boxed brownie mix. Don’t despair as I did, it all soaks into the cake and looks quite presentable within 15 minutes. I cannot tell you how pleased I am with this cake. I feel like a smug cat sitting by a private vat of cream or a parakeet who just stumbled upon a lifetime supply of millet. I feel like sitting by a crackling fire while shod in sheepskin slippers, I feel like dancing to The Firebird too fast for the eye to follow. It is that good. My husband says this needs to go in the next Family Cookbook and I believe it will be my first recipe that is truly my own, not just tweaked from something else. 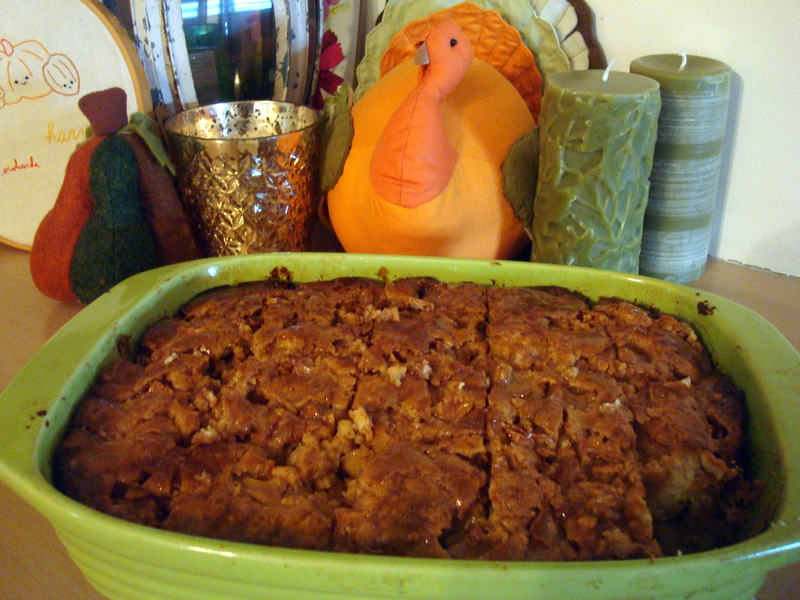 For the moment we will call it a Caramel Apple Buckle but someday it will be called Grandma Hananh’s Apple Cake. Future generations may discover it when their children do headstone rubbings over my grave. It is that good. Looked so good, I had to make it today! No caramel sweetened condensed milk here, so I just melted some caramels and mixed them with the regular stuff. Smells heavenly! !